What is the best Shark vacuum cleaner? That’s a tough question because, when it comes to the best rated Shark vacuum, there are a lot to choose from. If you’ve found it overwhelming to compare Shark vacuum models, don’t worry! We did the research for you and used the information we collected to put together this Shark vacuum cleaners review. Before we get to the best Shark vacuum, let’s take a closer look at some of the important features you should know. Type: There are basically 3 types of vacuums that we included on our list: upright, stick, and handheld. Uprights are the most common but get this: most of them easily convert to a handheld or a canister. 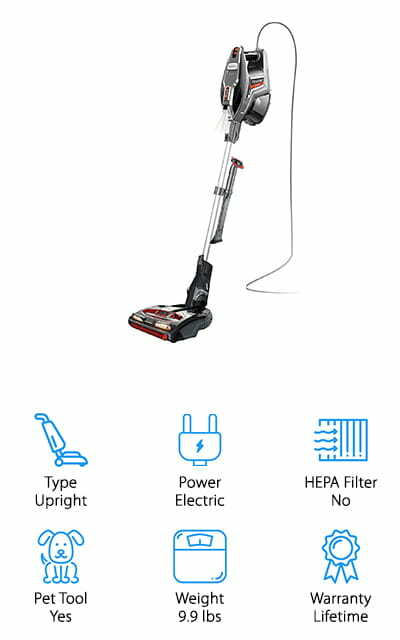 Power: In our best Shark vacuum reviews, you’ll find both electric and battery powered models. Some of the battery powered ones even come with 2 batteries. This is great because it means you’ll no longer have to wait for a recharge. 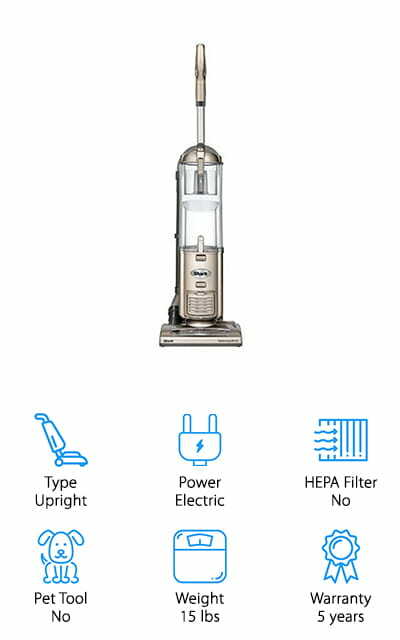 HEPA Filter: If you have a pet air or allergy problem and have been wondering, ‘Which shark vacuum is best for me?,’ here’s our suggestion. Get a HEPA filter. They trap 99.9% of dust and allergens and can improve air quality. Pet Tool: Another must-have, if you have furry animals, is a pet tool. They can really help you get out ground in pet-hair from your carpet and furniture. You might be surprised to see how much is actually hiding. Weight: All of these vacuums are surprisingly lightweight. In fact, the range from 15.5 pounds all the way down to only 3.8! Make sure you get something that’s light enough that you can easily get up and down the stairs. Warranty: We have to say, Shark is pretty generous with their warranties. All of these are covered and the warranty periods range from 1 year to a lifetime. Generally, the higher end models are the ones that include a lifetime warranty. Now that you know what to look for when trying to find the best Shark vacuum, let’s move on to our reviews. Here’s the deal: our top and budget picks are first. That’s a great place to start if you’re in a hurry because you get a good idea of the range that’s available. Every product in our Shark vacuum reviews is unique, though, so read on if you can. So, what is the best shark vacuum? Let’s find out. Our top pick is the best Shark upright vacuum cleaner, the Rotator Professional Vacuum. This is a 2-in-1 vacuum that’s both an upright and a lift-away. Just push one simple button and you’re ready to go portable. Add the premium pet power brush and you can easily get all that dog or cat hair out of your furniture. This vacuum also has a HEPA filter, just one more reason why it’s such a good pick for anyone who has a pet. As an upright, you get excellent control to easily move around furniture. There’s an LED light, too, that allows you to see exactly where you’re cleaning, even in low lighting. The canister has an extra-large capacity so you can get a lot done without having to stop and empty it. Our budget pick is actually the best Shark vacuum for hardwood floors and carpet. Plus, if you’re wondering what’s the best Shark vacuum that’s both cordless and lightweight, it’s the Shark Rotator Freestyle Vacuum. There’s a 2-speed brush roll, which is what makes it so good for both carpets and floors. It weighs only 7.5 pounds and has powerful LED headlights on the nozzle. It’s really easy to maneuver and spot hidden debris around your home. The dust cup has an extra-large capacity so you can clean for a long time without having to empty it. But, when the time comes, it’s really easy to do. 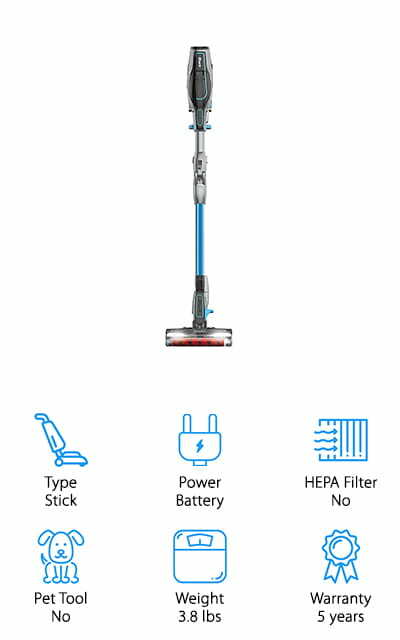 This vacuum also includes a charging stand. All you have to do is place it when you’re finished and wait for it to recharge. Last but not least is the Shark Pet Perfect II, the best Shark vacuum for pets if you’re looking for a handheld. If you’re wondering which is the best Shark vacuum cleaner that’s specifically designed for above the floor surfaces, this is a good pick. It’s equipped with Twister Cyclonic Technology for strong and consistent suction while you clean. The powerful 18V battery delivers 35% more suction than a 15.6V model and it comes with a convenient charging stand and wall mount. Plus, there’s a motorized pet brush, dusting brush, and crevice tool included. The handle has a rubberized grip that’s really comfortable to handle, too. 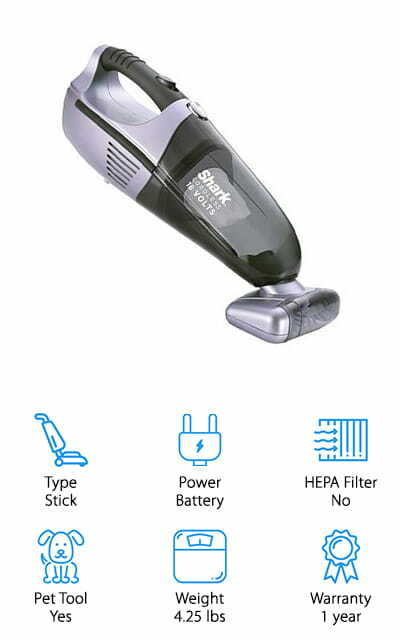 You can get embedded pet hair off your furniture and detail your car to a professional level of clean with this best Shark vacuum cleaner. 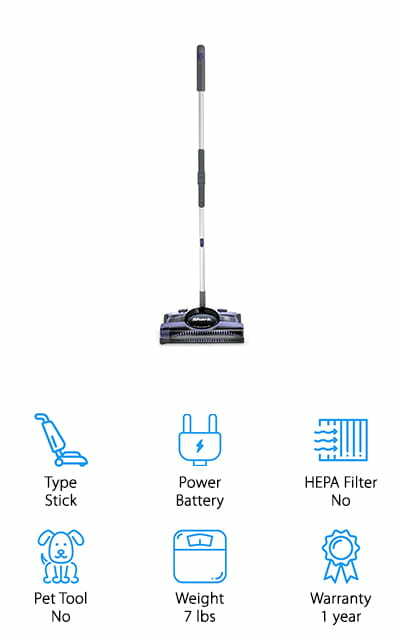 This next top rated Shark vacuum is a great choice if you’re looking for a stick vacuum that has a remarkably long battery life. What makes us say that? The 2X ION Power Pack System includes 2 removable, rechargeable batteries. That means you’ll always have a second one ready to go so you won’t have to stop cleaning. This stick vacuum is also equipped with MultiFLEX Technology so you can easily get underneath furniture. There’s a bristle brush to deep clean carpets and a soft brush roll to get larger debris from the surface. Get this: it also converts to a handheld so you can easily use it on your steps or even take it out to your car. There are a lot of goodies included, too, like pet multi-tool, anti-allergen brush, and a crevice tool. The Shark Navigator Deluxe NV42 is one of the best rated Shark vacuum models. 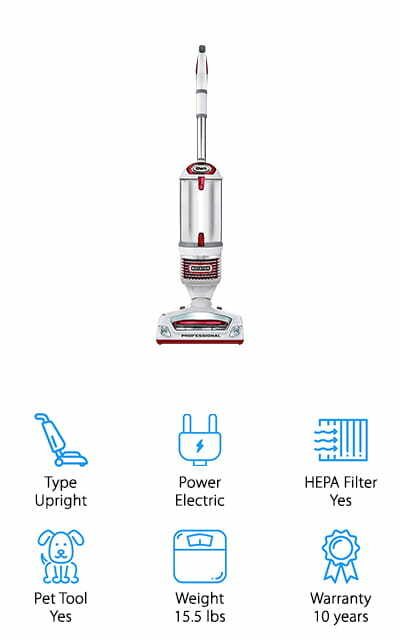 It’s another good pick if you’re looking for a good vacuum for the money because it’s pretty affordable. This is a really basic model but, don’t worry, it performs like a Shark and delivers powerful cleaning and never loses suction. Because there’s a 25 feet power cord, you can reach just about every corner of the room without having to unplug. That’s not all, the dust cup holds a lot of mess, too, so you don’t have to empty it too often which allows you to clean even longer. This vacuum is great for both hard floors and carpet. It easily transitions by using the simple brush roll shutoff feature. It comes with some accessories, too, including an upholstery tool, dusting brush, and crevice tool. Next up is a Shark pet vacuum that you have to take a closer look at if you live with a lot of furry friends. It’s easily in the running for best Shark vacuum for pet hair because it’s such a good pet cleaning tool for any surface. It has a lift-away canister, too, so you can take it just about anywhere. This vacuum includes both a pet multi-tool and a TruePet motorized brush so you can finally get rid of all the ground in pet hair. Because it has an anti-allergen seal and a HEPA filter, this is also a good choice for anyone who has pet allergies because it traps 99.9% of dust and allergens to really improve air quality. That’s not all. It has swivel steering and LED lights for extra convenient cleaning. The DuoClean Rocket is an interesting model because it’s an upright that could pass as a stick vacuum. It also might be the best Shark vacuum for hardwood floors, too. It includes a bristle brush to get deep down in your carpets and a soft brush roll that gets the bigger debris off your hardwood floors. It leaves them looking clean and polished. There’s more, this vacuum also converts into a lightweight handheld vac for all your above the floor cleaning. The pet multi-tool comes in really handy when you need to clean upholstery or stairs. To help you catch anything you may have left behind, there are LED lights integrated into the floor nozzle and hand vac. And get this: there’s no front wall so you can directly attack large pieces of debris. 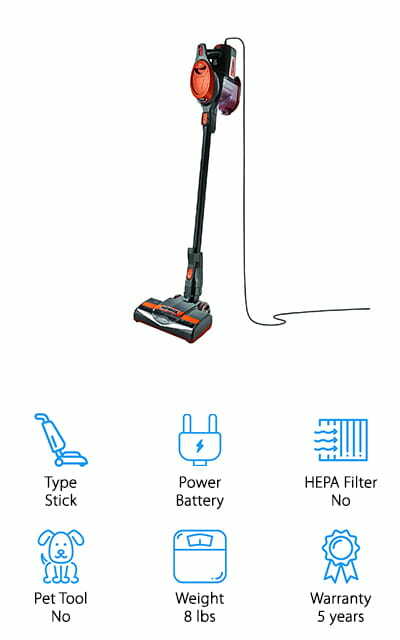 If you want a top Shark vacuum but don’t want to spend too much money, the Shark Rechargeable Sweeper just might be the one for you. This is a lightweight stick vacuum that’s pretty simple but performs just as you would expect a Shark to. It includes a powerful motorized brush roll that can sweep up any size or type of debris. Because it’s so slim and it has a back saver handle, it easily slides under furniture and into hard to reach places so you can clean just about anywhere. With 2 speeds and a 55 minute run time, you can really get a lot done. That’s not all, the edge cleaning squeegee is an awesome feature. It grabs debris from along the walls and edges for superior cleaning on carpet or hard flooring. The Shark Navigator NV356E is the best Shark vacuum for carpet but it’s also a great choice for hard floors. In fact, it has a brush roll Shutoff button that allows you to go from carpet to hard floors quickly and easily. That’s not all, you can also use it as both a canister and a lift-away vacuum. It’s really versatile. Take it from the floor to the couch to your stairs quickly and easily. 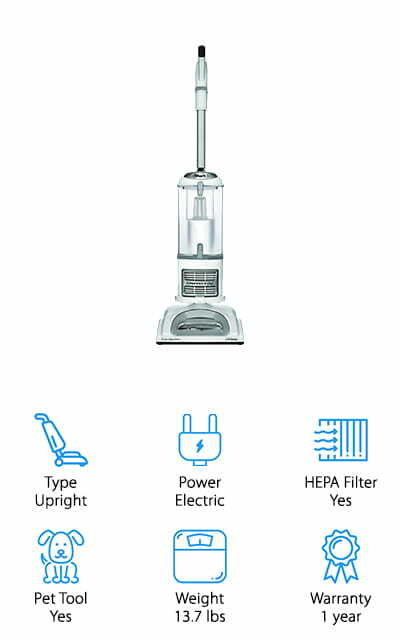 This top rated Shark vacuum also comes equipped with anti-allergen technology and a HEPA filter. It’s actually a completely sealed system so nothing escapes into the air. Dust and allergens are trapped and it even includes a Pet Power brush which makes it an ideal choice for any home where shedding is a problem. Considering its power, it’s lightweight at only 13.7 pounds. Our next pick of the Shark vacuum models is the Rocket Upright. It’s ultra-lightweight at only about 8 pounds. Something really cool about this model is that it easily converts into a hand vac so you can use it to clean just about anything. Plus, they include a home and car detail kit that contain the micro-tools you need to clean even the tiniest of spaces. You can really get your car as clean as a professional detailing service. When using it as an upright, go from carpet to hardwood quickly by flipping a simple switch right by your fingertips. Plus, you can use the Dust-Away hard floor attachment to pick up larger pieces of dust and debris from your hardwood floors. It’s also equipped with swivel steering to easily move around your furniture.